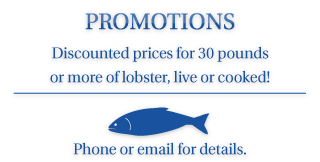 Indulge yourself, Lobster season is upon us! May and June prices are at their best! Our customers are seafood lovers of all ages, and people interested in trying new and exotic seafood. Some come for special occasions, some return every week or every couple of days. They love our friendly, reliable service and competitive prices. We are committed to keeping our prices low while providing you with great quality and service.